When Gangnam Style galloped into hearts across the world and became a bonafide phenomenon, inquiring minds wanted to know: has Kpop finally been wrestled from the fingers of those really nerdy outcasts in middle school who were fascinated with Asian culture (1999 Bryan says hi) and placed into the sphere of global popular music? In short, could Kpop finally sell big numbers in America? It’s a good question, and J-capitalists want to know the same thing about Jpop. Jpop has made several overtures to capture the American market but none have been wildly successful. Utada put out This is the One, which turned out to not be the one, but satiated her frothy stateside fan base and brought us, “Merry Xmas, Mr. Lawrence – FYI”. Puffy Amiyumi managed to eke out a few albums and were rewarded with a cartoon for their efforts. None of these albums were bad, nor were they popular. I was a lil surprised to hear some nihongo as I was leaving the theater for Wreck-It Ralph. As it turns out, AKB48 got the honor of closing the movie out with “Sugar Rush“, a song that at once evokes the fictional kart-racing game it’s named after and the popular American idea of what Jpop is. In any case, Sugar Rush is the song attached to the end of a major Disney picture and as such, will carry the seeds of jpop across the wind and hope they land in some fertile minds. 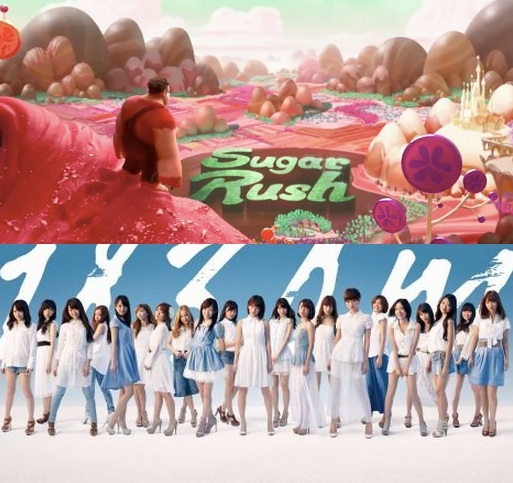 “Sugar Rush” was written by Akimoto Yasushi and composed by Jamie Houston, and the song has been picked up as the ending theme song to the film for the worldwide release. The members who are participating in the song are, Itano Tomomi, Oshima Yuko, Kashiwagi Yuki, Kawaei Rina, Kojima Haruna, Shinoda Mariko, Shimazaki Haruka, Takahashi Minami, Matsui Jurina, and Watanabe Mayu. It’s safe to say that Sugar Rush will never be Gangnam Style. “Ue wo muite arukou” is going to be the most famous j-song in America for a time to come. But globalization is real and if Japan is salty about Kpop’s global success, you can be damn sure they’re gonna start squeezing Jpop into American culture wherever they can fit it. Wreck- It Ralph may not be the most effective vehicle for that shift, but it’s a pretty big step. Why do we go on? We go on because we like to think there's hope. That's a lie. Ain't no hope.